The first half of the 2017 Holiday collection is accented with bright sparkle and dark blues. Their use of faceted stones and enamel in place of the usual pave stones makes for a stronger color that is beautifully contrasted by the clear CZs that add some shine to each design. 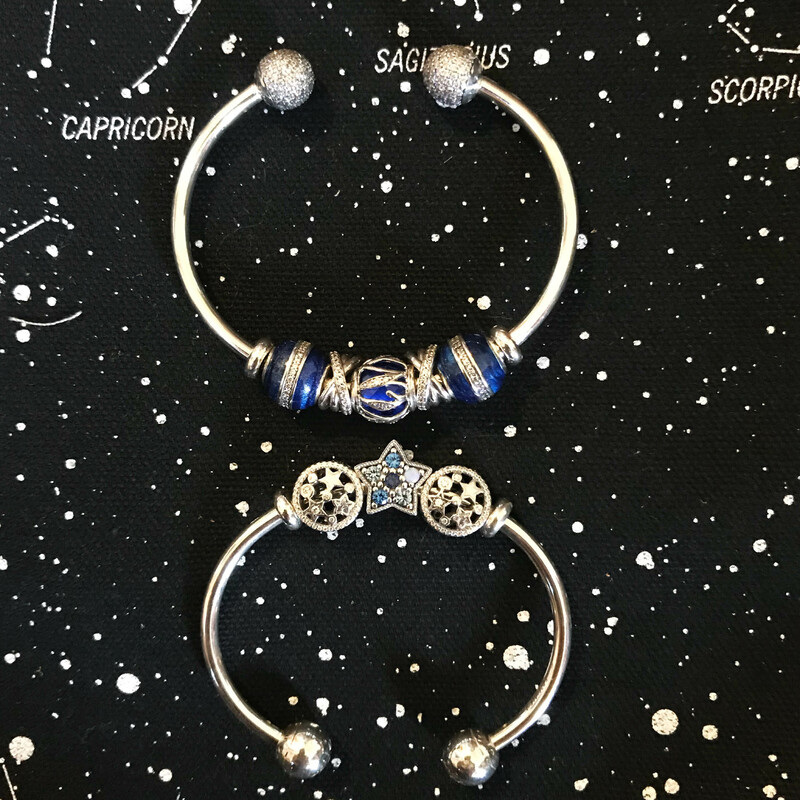 We love the new orbit charm ($55) combined with the galaxy spacers. 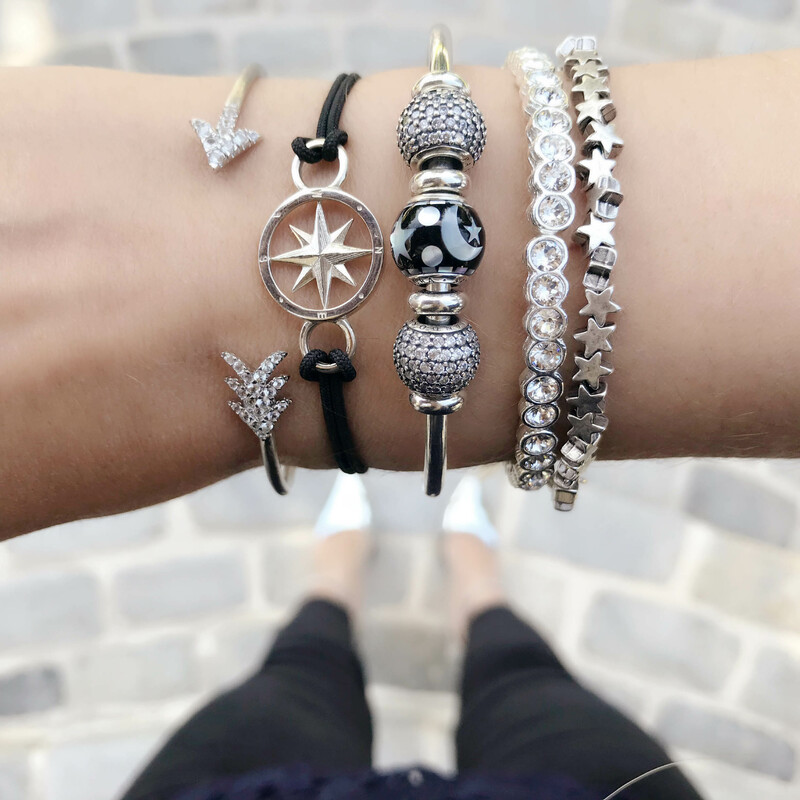 The new bright star ($75) charm makes a great centerpiece for the open bangle for the winter season. The glacial beauty charm ($90) is another gorgeous addition; its diamond shape works well with some of the geometric charms released in this year’s autumn collection. We also love this charm on a short chain as a dainty necklace! One of our absolute favorite charms of the new collection is the Celestial Mosaic charm ($65). Made with mother-of-pearl, the moon and stars have a beautiful iridescence. The smooth black surface is a great contrast in color and texture to the numerous pave charms available. 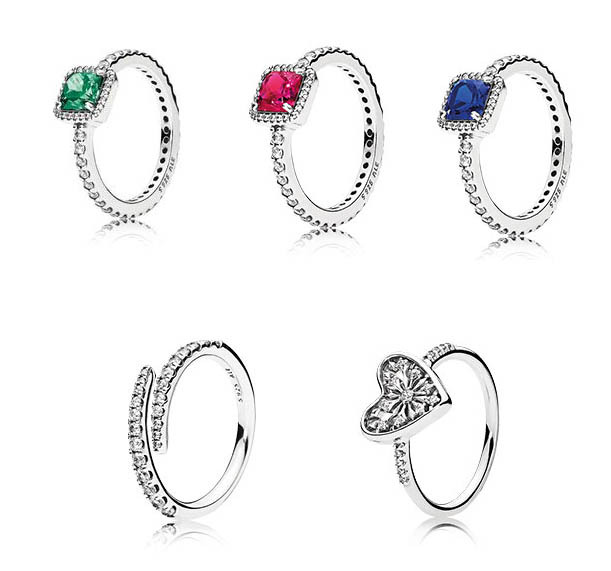 Pandora has updated the Galaxy charm and continued with the Nature’s Radiance charms ($70) by adding faceted blue and ruby red stones inside bright silver cages. The contrast between the silver and the dark stone underneath is really beautiful! 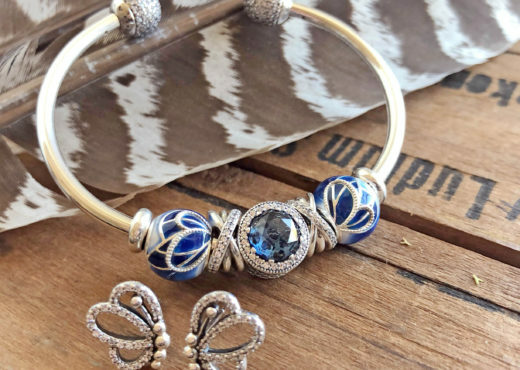 Continuing with the night sky theme, the Snow Flurry ($60), Dazzling Snowflake ($90) and Heart of Winter dangle ($60) charms feature snow motifs against clear and dark blue backgrounds. 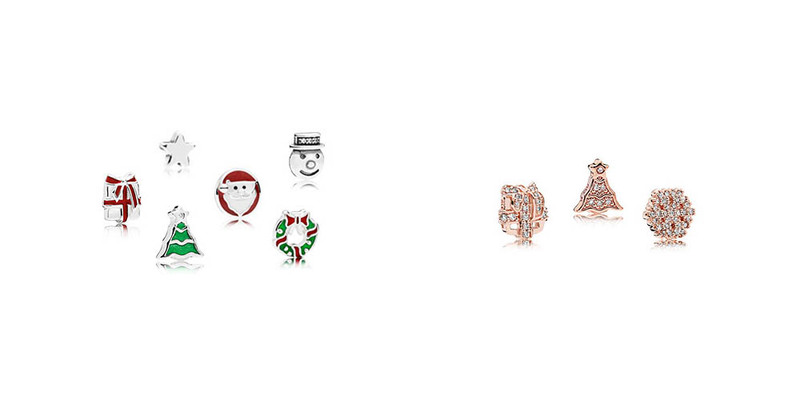 The Pandora Holiday collection also includes three new clip designs. 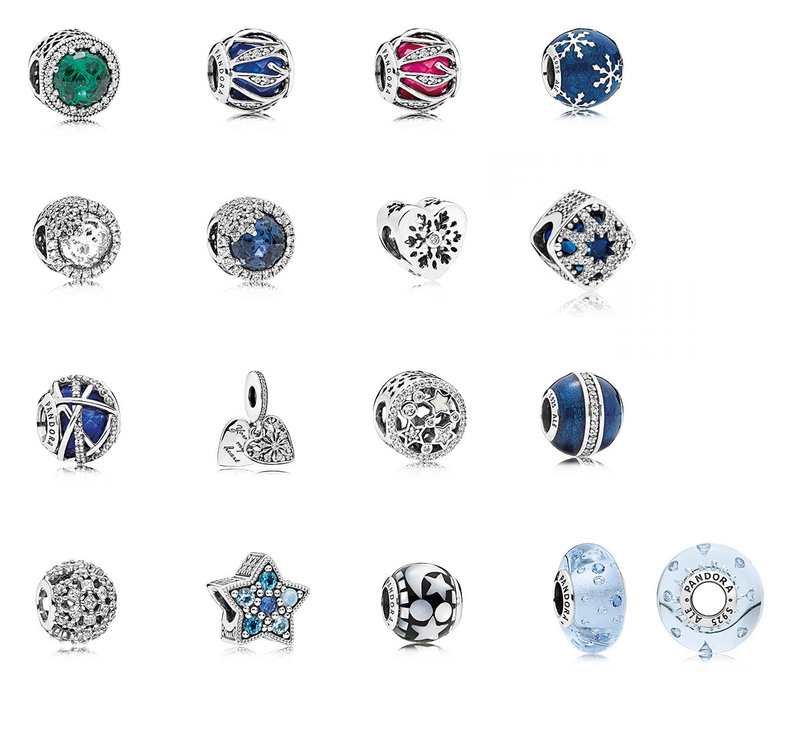 The Heart of Winter ($55) and Bright Star ($55) clips are charm-style clips following this year’s main themes. The Starry Formation ($45) is a spacer-style clip that is a great neutral piece. The Essence collection has also had a bold color update with this year’s additions. 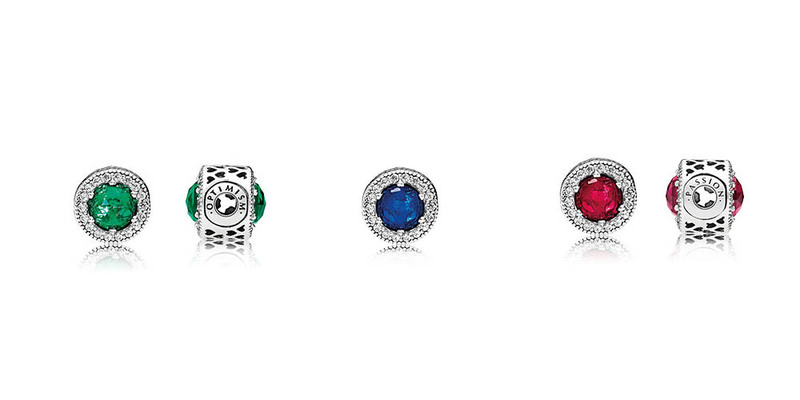 Three new charms featuring bright jewel tones have been added. 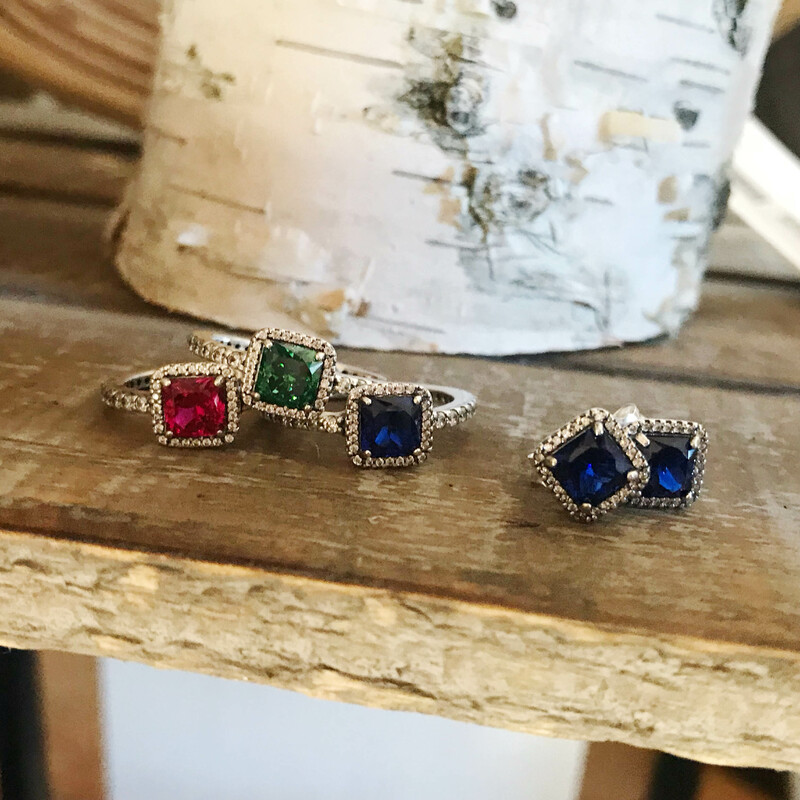 These beautiful jewel tones have also been used to update the Timeless Elegance ring style ($75). 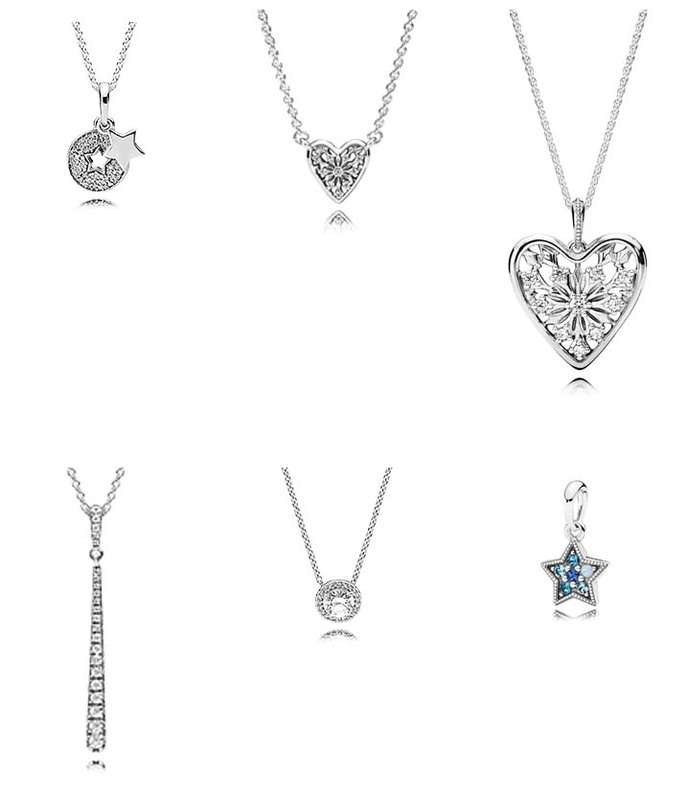 The other overarching motifs for Holiday jewelry include the Heart of Winter symbol ($60) and the Shooting Star ($70). 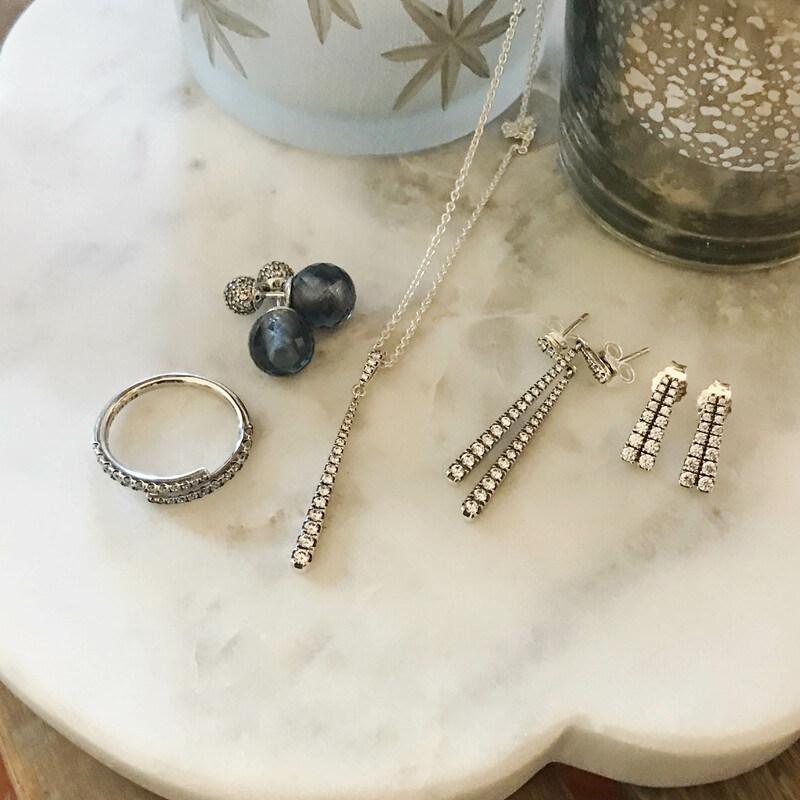 Our favorite so far this year is the sparkling elegance the shooting star pieces- they would make a great addition to any holiday party outfit! Several new necklaces have been released with the Pandora Holiday collection this year, ranging from small pendants to statement pieces. The Heart of Winter necklace is available in both a small ($80) and statement ($125) version. 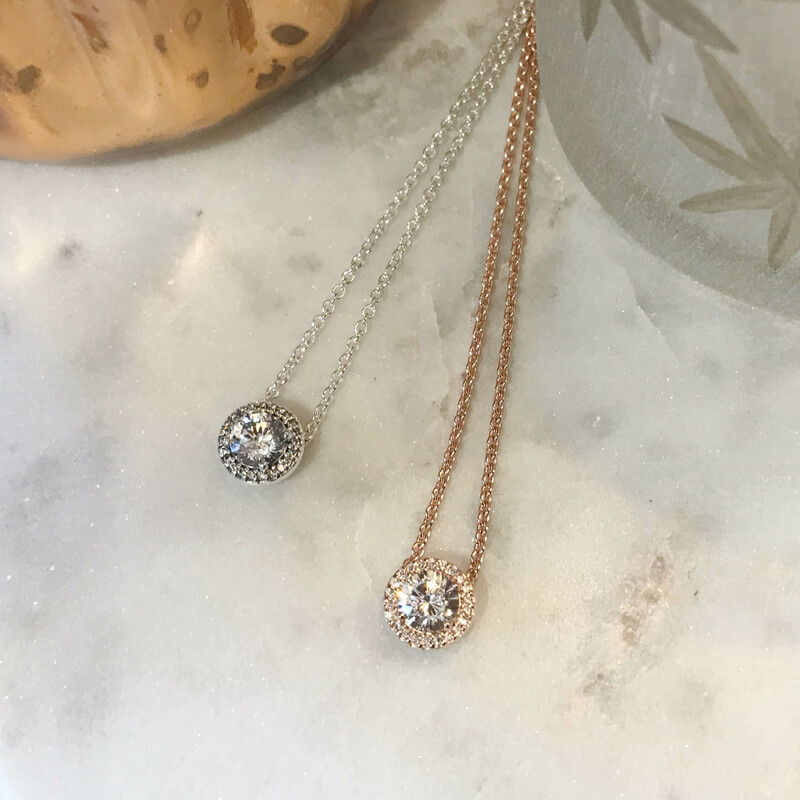 The Classic Elegance pendant has been reimagined as a dainty necklace ($90), and is available in silver and Pandora Rose. The Shooting Star necklace ($100) is also a beautiful, classic piece. 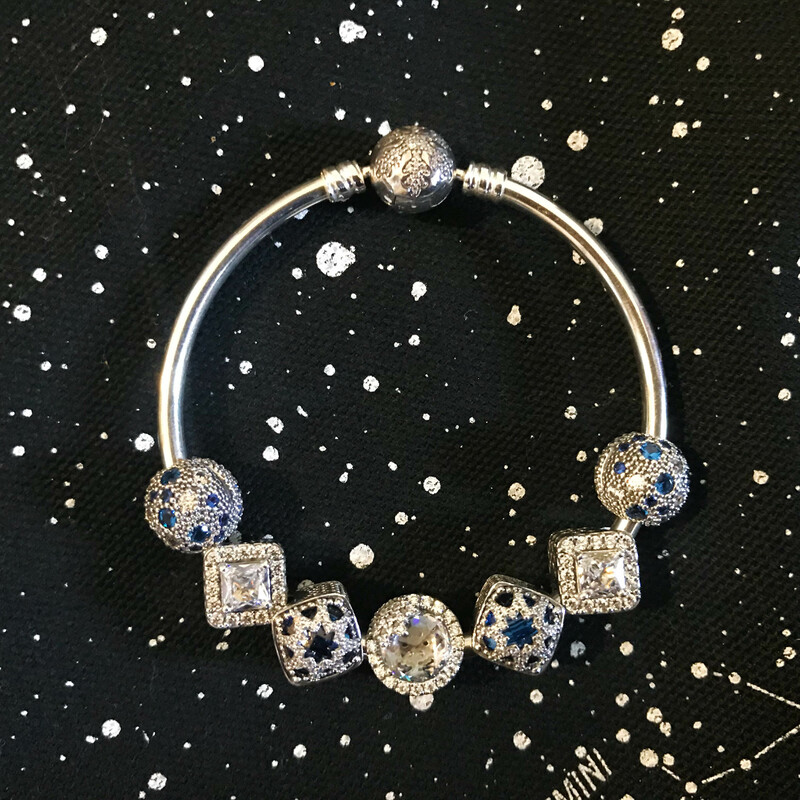 In keeping with the overall celestial theme, the new Pandora Holiday earring arrivals have a lot of clear sparkle with added accents of blue. 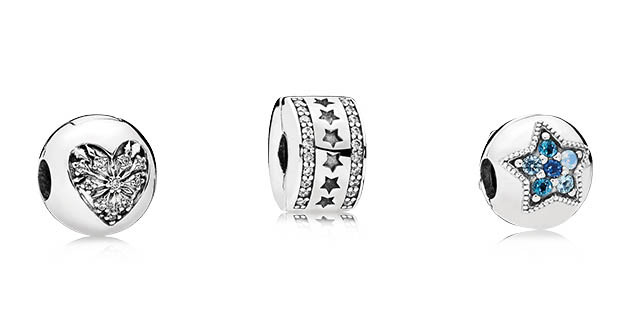 The Shooting Star earrings come in both a stud ($65) and statement ($75) style. 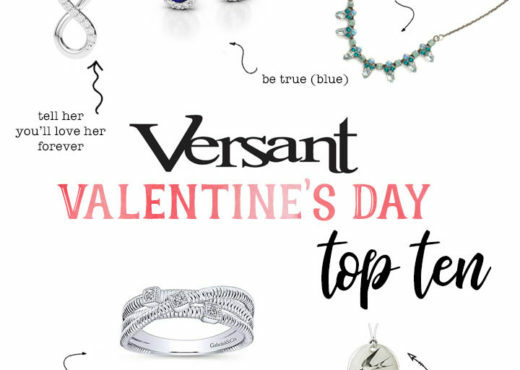 One of our favorites is the Shimmering Drop earrings ($85), which are reversible; one side is a sparkling stud and the other is a faceted midnight blue stone. 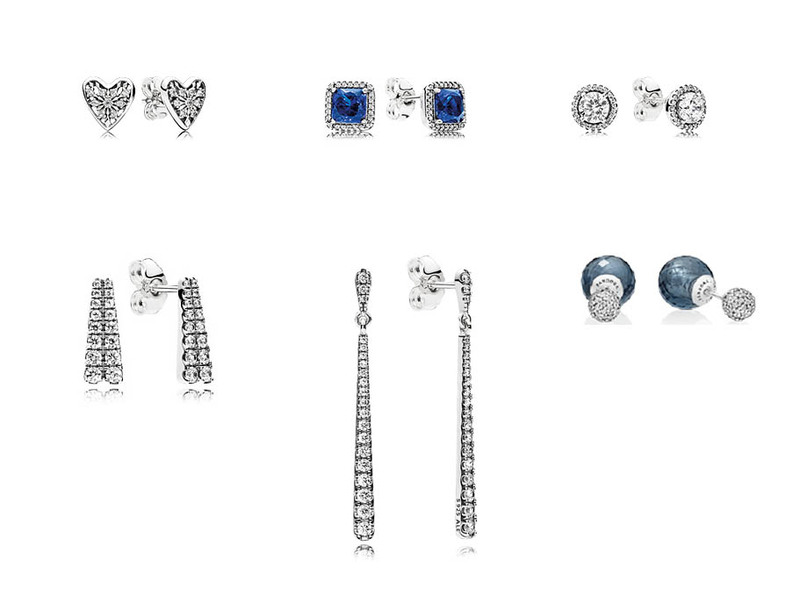 The Timeless Elegance earrings have been updated to include the dark blue stone as well. These would be a great gift for the bride-to-be! This year’s Christmas additions follow the tried-and-true formula of bright holiday reds and sparkling silver. In addition to the traditional red pieces, a pretty dark blue snow globe ($55) and Snowy Wonderland scene ($55) have been added. We love the new Holiday Wreath ($35) and Sparkling Candy Cane ($45) dangling additions- they are so bright and fun! The Christmas Polar Bear ($45) is a great whimsical addition as well. 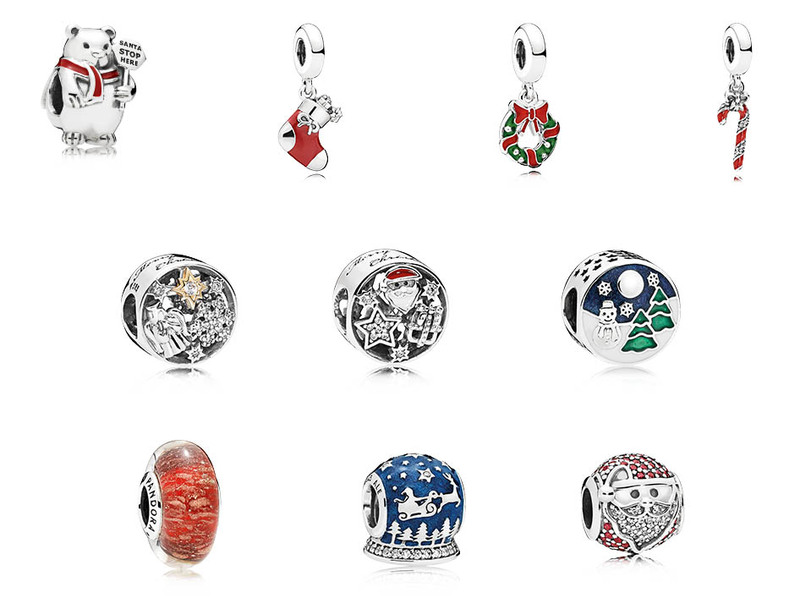 Several button style charms matching some of the new Christmas petites have also been released. For the Memory Locket lovers, there are some fun new additions as well. The bright Christmas Wreath and Jolly Santa are sure to bring anyone into the holiday spirit! For those who prefer a more neutral palette, the Rose petite additions look stunning in the locket. We particularly love the snowflake! 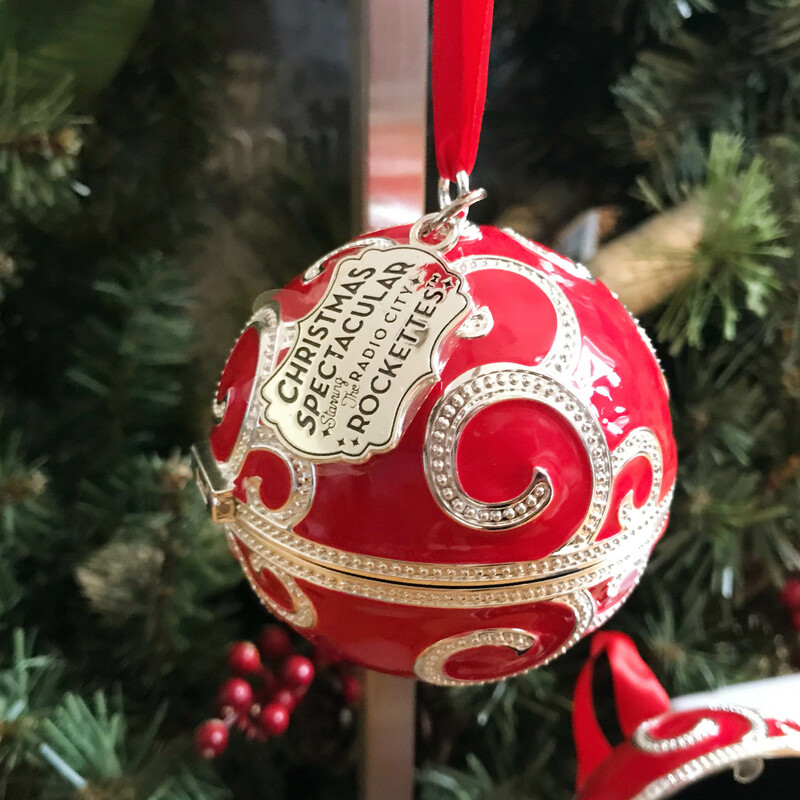 An extra-special holiday addition this year is the Rockette’s Limited Edition Bright Ornament charm. 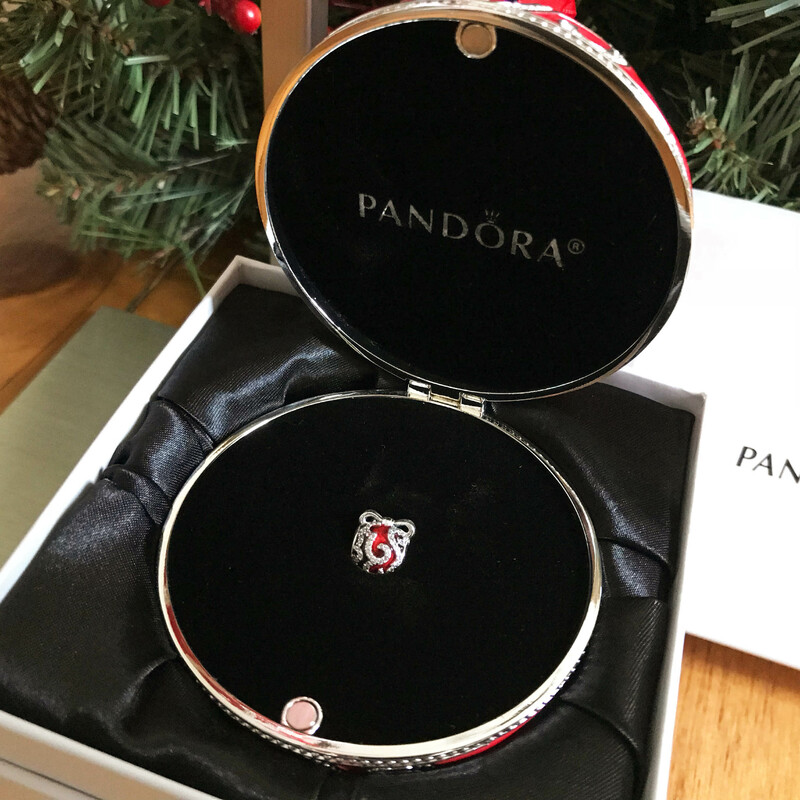 Not only do you get this beautiful LE charm with bright red enamel and swirling pave crystals, but it is packaged in a keepsake ornament box! 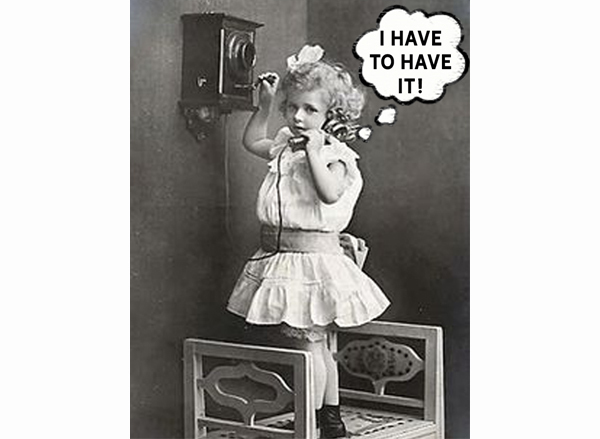 Both the ornament and the charm have the year engraved, making this a special collector’s piece. 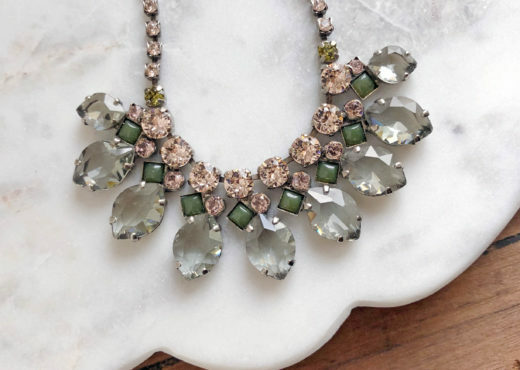 We love all of the new holiday pieces and are excited to share them with you! Make sure to stop by and see all of these beautiful additions in person. As always, we appreciate all of our customers who decide to #shopsmall during the holidays and throughout the year to support their local small businesses. Think Pink with the New Pink Lokai, now available at Versant!